44 slmag.net While a good hotelier will recognize the importance of conveying a sense of place, there are often constraints dictated by the property's size, budget and location. 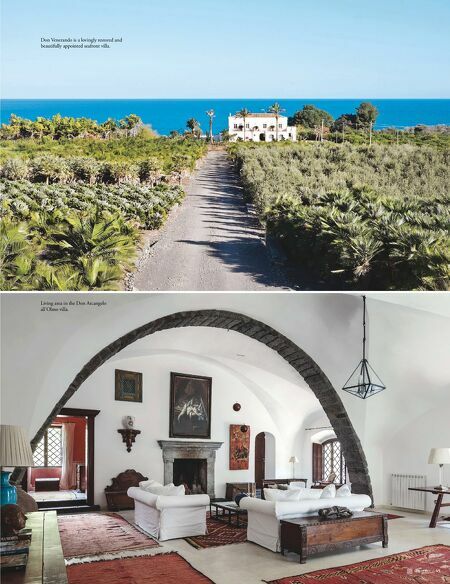 Villas in e inking Traveler Portfolio – from ancient farmhouses to modernist masterpieces – encompass myriad viewpoints of the ideal Sicilian experience. A recently refurbished lavastone farmhouse in Pozzillo, La Limoncella, boasts sea and Mt. Etna views and plenty of manicured outdoor spaces, including a divine lap pool and ample covered terraces to soak in the scene. Set amidst a working nursery with sweeping sea views (the owners are the world's largest exporter of Mediterranean plants), the Don Venerando villa was purpose built as a rental property, but no expense was spared in its construction or elegant interior design, which features top-drawer Biedermeier and Chinese antiques and original artwork. Built around the remnants of an old winery, the original wine press is ingeniously integrated into a half wall in the foyer. Portions of the tile floor were purposefully broken as they were hammered into place to emulate years of use. e owner/architect of the mountainside Ortensia villa in Giarre has filled his eclectic and modern home with a range of contemporary artwork that reflects his Sicilian and aristocratic roots as well as spoils from his far-flung travels. Sighilli is a seven- bedroom villa located within the Vendicari Nature Reserve, whose heated pool overlooks sandy beaches, vineyards and salt lakes that regularly attract flamingos. Casa Vera, a perfectly proportioned estate crafted out of concrete, caught the attention of Elle Décor Italia, which produced a feature story on the property. 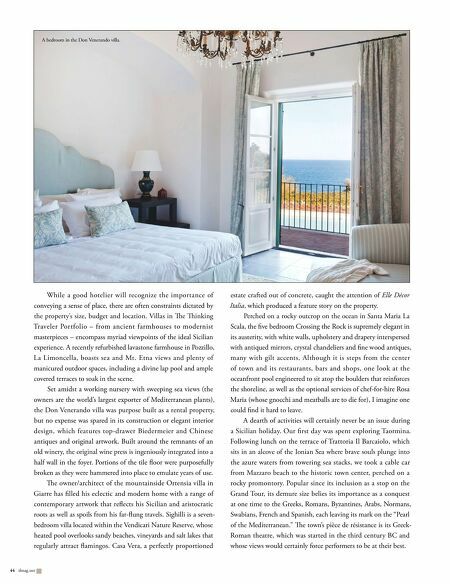 Perched on a rocky outcrop on the ocean in Santa Maria La Scala, the five bedroom Crossing the Rock is supremely elegant in its austerity, with white walls, upholstery and drapery interspersed with antiqued mirrors, crystal chandeliers and fine wood antiques, many with gilt accents. Although it is steps from the center of town and its restaurants, bars and shops, one look at the oceanfront pool engineered to sit atop the boulders that reinforces the shoreline, as well as the optional services of chef-for-hire Rosa Maria (whose gnocchi and meatballs are to die for), I imagine one could find it hard to leave. A dearth of activities will certainly never be an issue during a Sicilian holiday. Our first day was spent exploring Taormina. Following lunch on the terrace of Trattoria Il Barcaiolo, which sits in an alcove of the Ionian Sea where brave souls plunge into the azure waters from towering sea stacks, we took a cable car from Mazzaro beach to the historic town center, perched on a rocky promontory. Popular since its inclusion as a stop on the Grand Tour, its demure size belies its importance as a conquest at one time to the Greeks, Romans, Byzantines, Arabs, Normans, Swabians, French and Spanish, each leaving its mark on the "Pearl of the Mediterranean." e town's pièce de résistance is its Greek- Roman theatre, which was started in the third century BC and whose views would certainly force performers to be at their best. A bedroom in the Don Venerando villa.